Photoshop CS6 is packed with great new features, but not all of them are as immediately obvious, or as easy to find, as others. Some are practically hidden, like the new Photographic Toning presets for the Gradient Map image adjustment which let us choose from a collection of professional quality tinting and split-toning effects for our photos, all based on real-world chemical processes. These new presets aren't even loaded into Photoshop CS6 by default, so in this tutorial, we'll learn where to find them, how to load them, and how to use them to add great looking toning effects to our images quickly and easily. Clicking on the Gradient Map icon in the Adjustments panel. The Layers panel showing the newly added Gradient Map adjustment layer. Clicking the arrow to the right of the gradient preview bar. Choosing the Photographic Toning presets from the menu. 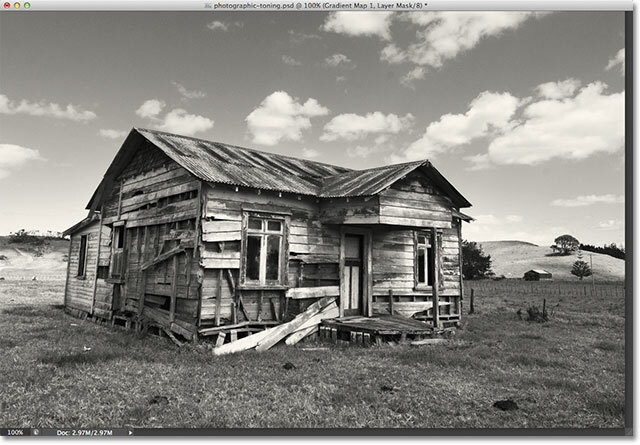 Clicking OK to replace the default gradients with the Photographic Toning gradients. The Gradient Picker showing the Photographic Toning preset thumbnails. Clicking again on the gear icon in the Gradient Picker. Choosing the Small List view option from the Gradient Picker menu. The Gradient Picker now shows both the thumbnail and the name of each preset. Expanding the Gradient Picker to view more presets at once. Selecting the Platinum tinting preset. The photo with the Platinum preset applied. Choosing a different preset from the list. The photo with Sepia 1 applied. The photo with Cyanotype applied. Selecting the Sepia-Cyan split-toning preset. With split-toning presets, the darker and lighter areas of the image each have different tones applied. Choosing the Gold-Selenium 2 gradient. The result of the Gold-Selenium 2 preset. Choosing the Reset Gradients option. Click OK to replace the current gradients with the originals. And there we have it! That's how to load and use the new Photographic Toning presets to quickly apply tinting and split-toning effects to your images with Photoshop CS6! Check out our Photo Retouching section for more Photoshop image editing tutorials!